Well, I was there, too. It was a good show....but sorry to contradict Andy not as good as the 2 Genesis shows at this venue on the two days immediately prior to Yes. Just imagine that though Sun/Mon: Genesis, Tues/Wed: Yes. Awesome mid 70's prog. Remember this gig very fondly. The Roger Dean stage set was a visual treat and I thought that Patrick Moraz was very good. 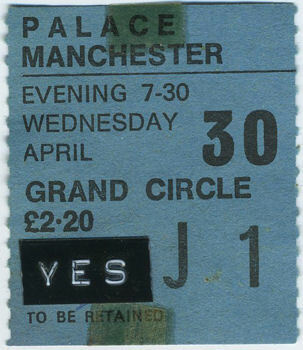 I wish the Palace was used more often for rock gigs, especially as the bands that have aged along with me probably would not outsell the venue. The sound in the Palace is a lot better than the Bridgewater Hall. What progressive music fans, familiar to Gentle Giant, may be intersted in, is that ,the Palace theatre featured on the cover of the Live Playing the Fool album. G.G. did not play the Palace theatre, like eveybody else at that time, Robin Trower ,Camel, Rory Gallagher, Genesis they all played the Free Trade Hall .